Sometimes whole neighborhoods will get into the act, banding together to hold a much larger sale with the hopes of attracting more buyers – and ending up with more profits for all involved. Personally, I’ve attended only a handful of these sales, and held two of my own, both of which were only marginally successful. So before reading this book, I \’d never really considered thrifting as anything more than light summer entertainment. 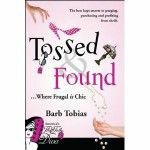 In Tossed & Found, Barb Tobias takes you on an amazing journey, sharing tales of treasure; revealing how to clear the clutter from your home and resell it; and uncovering the secrets to decorating and dressing on the cheap — with fantastic results. Whether you’re a transitioning Baby Boomer or a college student trying to figure out how to furnish your first apartment, you’ll find help in this book which is chock full of photos, lists and tips. In Tossed and Found, author Tobias dishes up a generous plate of intriguing stories pulled from the frugal adventures of a newly thrift-conscious nation, and shows the adventurous reader how to find the treasures beneath the tarnish. Highly recommended.